At the turn of the twentieth century, some of the sparkliest jewel collections in Britain were owned not by the nation’s royal princesses but by the wives of aristocrats. 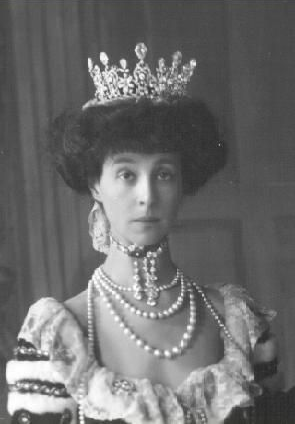 One of the most magnificent aristocratic tiaras around belonged to the American-born wife of the Duke of Marlborough, Consuelo Vanderbilt. The tiara, which was set with more than a thousand diamonds, was made in the 1890s by Boucheron. It was given as a wedding gift to Consuelo by her father William Kissam Vanderbilt. Against her wishes, and almost against her will, Consuelo married Charles Spencer-Churchill, the 9th Duke of Marlborough, in 1895. It was one of those infamous “buccaneer” marriages of the Gilded Age — the rich American bride would bring with her a substantial dowry that would help fix crumbling manor homes and pay off debts, while the aristocratic British husband would bring with him a title and status for his new wife. Even though the marriage produced two sons, it was ultimately unhappy. 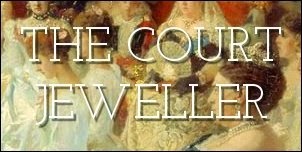 Even so, Consuelo became socially prominent, and she wore her Boucheron tiara at some of the most important gatherings of British society in the Edwardian era. This included two coronations. 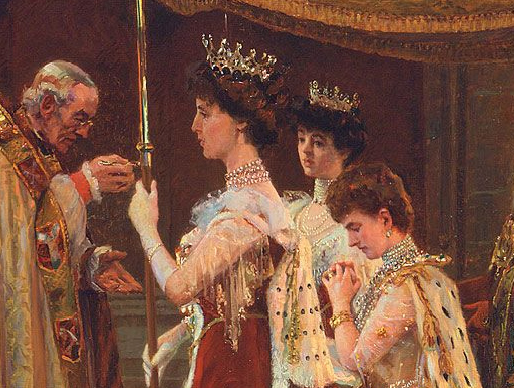 She wore the piece at the crowning of King Edward VII and Queen Alexandra in 1902, where she was one of four peeresses who held a canopy over Queen Alexandra’s head during the ceremony — a moment immortalized in a painting by Laurits Tuxen (detail pictured above), in which you can clearly see the Boucheron tiara. Consuelo also wore the tiara at the coronation of King George V and Queen Mary nine years later, even though she had been separated from her husband for several years at that point. 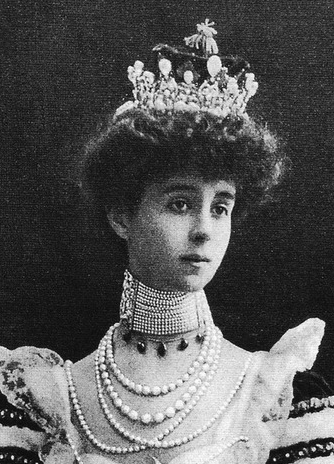 By 1919, Consuelo’s marriage was nearly at an end, and so was her connection with this tiara. In December of that year, she auctioned her tiara at Christie’s in London. The New York Times report on the sale describes the tiara as a “magnificent brilliant tiara, of foliage and scrollwork design and surmounted by nineteen large, pear-shaped stones of the finest quality.” According to the report, the piece was purchased for £23,000 by S.H. Harris & Son, a Bond Street jewelry firm. 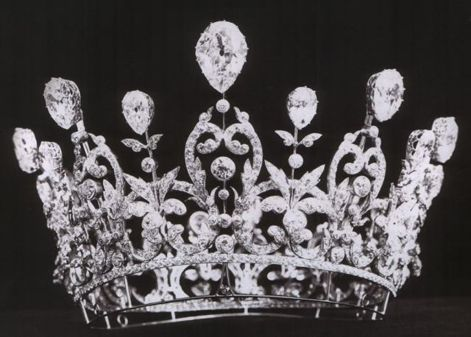 The firm bought the tiara specifically to break it up and reuse the diamonds. The Times write-up also observes: “The auction room was crowded with women. The suggestion is made that the Duchess sold the ornament because tiaras are becoming old-fashioned.” In reality, Consuelo sold the tiara just before her divorce proceedings began. 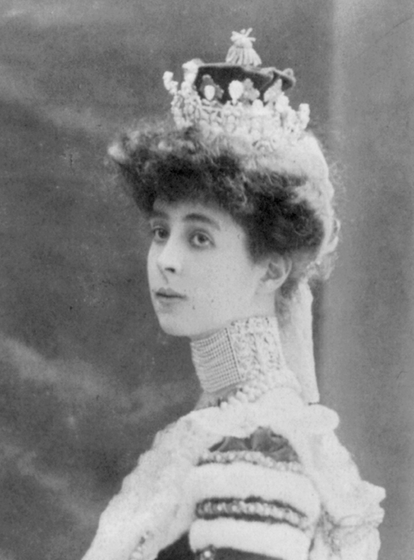 And in another anecdote, she recalls a dinner with the Prince and Princess of Wales (later King Edward VII and Queen Alexandra), to which she wore a diamond crescent hair ornament rather than her tiara. Apparently this rubbed Bertie the wrong way, and she was forced to admit that she was late to retrieve the tiara from the bank where she kept it because she’d spent too much time at a charitable function. Not a bad excuse to give a future king, eh?